Confessions of a YarnAddict: All bordered out. Not had time to blog this weekend as I've been working flat out on the Victoria Shawl. Love the way the border is looking but it's hard work. The long sides of the shawl is very long and it took 20 repeats to get to the corner (each rep is 18 rows). I found knitting into the edge stitches no problem at all but when I turned the first corner and had to knit into live stitches I got stuck. No idea why - just couldn't get it right so frogged back to before the first corner. Thank goodness for lifelines. This was Saturday evening and I was determined to get around the corner before I went to bed so had a late night. By the time I'd finihsed the corner I was shattered, in agony and couldn't see straight. But I did it. And btw, this is my first ever knitted on border and I've got noone to teach or show me in person how to do it. Can you tell I'm quite proud of myself. The shawl should have been in the post today at the latest but as you can see i've stil got half a border left so it's not going to get to Norway by Friday. I wish I'd started it earlier. Never knew how long the border would take. I'm gettig slightly worried about running out of yarn too. Should have 50 yards more than needed so should be okay. As I'm half way around the border I think I will weigh the yarn to see how much I've used and whether I need to panick or not. You'd think I'd learnt my lesson with my Alpine lace scarf when it comes to the subtle difference between skeins of hand dyed yarn but I didn't . When i started the 2nd skein of this yarn I noticed that the 2 skeins i had left where slightly different in colour intensity so chose the yarn closest to the first skein and it was perfect. Left the 3rd skein for the border thinking it didn't matter if it was slightly brighter. And it would have been fine but I'll need half the skein I've got left from the main rectangle to finish the border so again will have a difference in colour and I'M NOT FROGGING IT NOW. Hopefuly it won't be too noticeable. Anyway, the shawl is taking a break as it won't be finished for my Mum's holiday. I want to finish Em's 2nd Speedway sock. That'll give me something to show for SAM3 and Crafty Yarn's Sock a Month. I've actually knitted 2 complete pairs of socks this month but they're both top secret ones and can't be shown online yet. So annoying. One of the members of Crafty Yarns have seen pics and vouched for me for the Sock a month challenge but still need something to post on SAM3. Wanted to finish a cashmere shawl for our holiday staring on Saturday and have got 2 otn. Both in Posh Sophia 4ply. One is this wonderful dark purple (much darker than in pic) but I've got a long, long way to go. 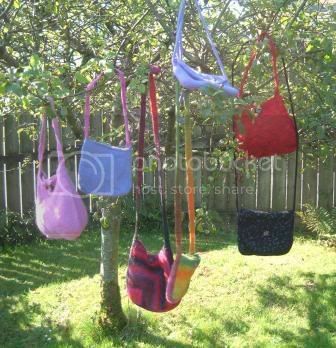 Also wanted to knit a felted bible bag before we go but can't see that happening. While we're away it'll be sock all the way. Got a pair to knit up for a submission and a couple of other pairs to finish. Just want to show a quick pic of my new glasses. Hubby and I had eyetests and new glasses todya. Cost us far too much but we're both happywith our choices. Might see if I can get a flattering pic of me wearing the glasses sometime this week but looking to rough tonight to haveany photos taken. Will blog about the pics below tomorrow. Too tired now and have got some nit combing to do. Think we've finaly got rid of the little beasts but got to check to make sure. In the meantime you can havea guess at what I'm working on below. I love your Victoria Shawl! I'm sorry you won't get it finished in time. The shawl is looking beautiful and will be much appreciated I'm sure. I have yet to brave lace and I think it will be the DK version! Thank you. Go for it Yorkie. It's not half as difficult as it looks. And although I was terrified of laceweight yarns for a while I love them now. Sock weight yarns are a great yarn to start doing lace with. Anni you should be proud of yourself as the Victoria shawl is looking stunning and well done on the border. The cashmere shawl is stunning too, as are the socks. But try to take it easy and have a rest now and then Anni, and enjoy Spring Harvest. Piglottie has taken every word right out of my mouth, on both the compliments and sage advise.